Goodnight Horsemanship Clinics are two-days, Saturday and Sunday, from 8:00 AM to 5:00 PM. Cost is $400 per rider; plus stall fees, if needed. Riders will register for one of two horsemanship sections; there will be a maximum of 12 riders per section, to insure individualized attention and progress toward your training goals. •	Horsemanship Essentials will be for less-experienced horses and/or riders who want to work on ground manners, fundamental riding skills and building confidence. Riders should have basic control at the walk and trot. •	Advanced Training is for more experienced horses and riders, who want to improve horsemanship skills and advance the horse’s performance. Riders are expected to work at all three gaits. 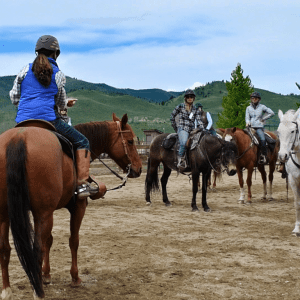 Both groups will work from the ground and from the saddle, with an emphasis on communication, leadership and improving riding skills. Riders are encouraged to audit the other section, to observe other horses and riders, in order to make the most of the learning experience. Auditors (spectators) are always welcomed at Goodnight Horsemanship Clinics and tickets are $25 for adults and $15 for youth. Auditors will have the opportunity to observe, ask questions and network with other horse lovers.